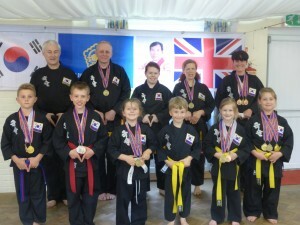 Classes are for boys and girls aged from 7 to 12, and are for beginners . All of our junior classes teach more than just martial arts. They teach how to become good citizens and to be prepared for life. These skills will help the students become well-rounded by contributing to the child’s social, emotional, physical and intellectual growth. Our unique children’s program is designed to teach students far more than just how to kick and punch. We are very concerned with the well-being, health and education of children, and aim to influence all our children in becoming achievers in life as well as martial arts. We promote non-violent resolutions to conflict, yet we strongly believe a child must develop the skills and ability to defend themselves. We believe in praise, encouragement and positive reinforcement. Parents that work with us as a team will enjoy seeing their child strive for excellence, at school, home and Kuk Sool Won™.